Journal wrap errors occur if a sufficient number of changes that occur while FRS is turned off in such a way that the last USN(Update sequence number counter) change that FRS recorded during shutdown no longer exists in the USN journal during startup. The risk is that changes to files and folders for FRS(File replication service) replicated trees may have occurred while the service was turned off, and no record of the change exists in the USN journal. To guard against data inconsistency, FRS asserts into a journal wrap state. Let me simplify the statement, FRS has an internal database that contains all the files and folders it is replicating and each of these has a unique global ID (GUID). The database also contains a pointer to the last NTFS disk operation (in the USN Journal/NTFS Journal) that the FRS service processed. If it should be replicated, the file goes into the normal process of staging, replicating, etc. If there is a situation that the replication files has got few changes and the DC's doesn't communicate with each other because replications partners was shutdown for a long time, FRS was not running or because of a communication failure in the network. When the communication is reestablished, FRS still knows the last NTFS Journal entry that it processed and it will compare this with the current NTFS Journal the next time it restarts. The next time the FRS service starts, it sees that it has missed NTFS operations on the disk(It compares the its last processed NTFS operation and current NTFS journal database). This is when FRS complains it has reached a Journal Wrap state, the NTFS Journal log has wrapped around and it doesn’t know the current state of things on the disk. 1)As discussed above when there is a replication failure you will see the journal wrapper errors in the event logs. Start->Run->type 'replmon' ENTER, This will open the replication monitor window. Now add the servers one by one to observe the status of replication. 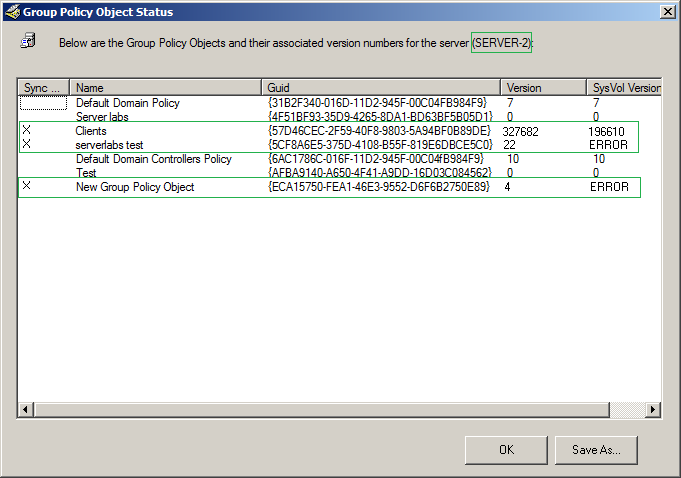 Once it is added right click on each server and select the option 'show group policy object status'. It will show you a windows that indicates the status of GPO replication for the particular server. Here you can find out the servers that has the good SysVol and corrupted as well. When the replication is success on a server it will have a blank 'Synch Status' Column, in addition the 'Version' and 'SysVol Version' columns will have identical numerical values. When there are issues in replication you may find the group policy object status as below. In my case I have three GPOs that are failed to replicate to second server(Serer-2). Namely that are 'Clients', 'serverlabs test' and 'new group policy object'. A good copy of sysvol will have a blank 'Synch Status' Column, in addition the 'Version and 'SysVol Version' columns will have identical numerical values. Here on the corrupted policies you can see the Synch status with a cross mark and its Version and SysVol versions are different or ERROR. Please make sure that you have a full backup of all your domain controllers before continuing with this process, this will help us to restore from backup if we do not have a good copy of SysVol in any of the servers. Generally there are two methods which you can consider to resolve the replication errors. Let us consider these one by one. This method is used when individual members of FRS replica sets that are having difficulty like assertions in the FRS service, corruption of the local jet database, journal wrap errors or FRS replication failures. It is recommended to perform a non-authoritative restore before you consider the authoritative restore. Note: Performing the below steps will reinitiate the replication again from its replication partner. So make sure that the replication partner of affected server has a good copy of SysVol. Perform the below step on the server which is affected with replication issues. In the Open box, type cmd and then press ENTER. In the Command box, type 'net stop ntfrs'. In the Open box, type regedit and then press ENTER. Locate the directory 'HKEY_LOCAL_MACHINE\System\CurrentControlSet\Services\NtFrs\Parameters\Backup/Restore\Process at Startup'. In the right pane, double-click 'BurFlags'. In the Edit DWORD Value dialog box, type D2 and then click OK.
Quit Registry Editor, and then switch to the Command box, type net start ntfrs and close it. The above steps performs the below actions. The value for BurFlags registry key returns to 0. An event 13565 is logged to signal that a nonauthoritative restore is started. The FRS database is rebuilt. The member performs an initial join of the replica set from an upstream partner or from the computer that is specified in the Replica Set Parent registry key if a parent has been specified for SYSVOL replica sets. 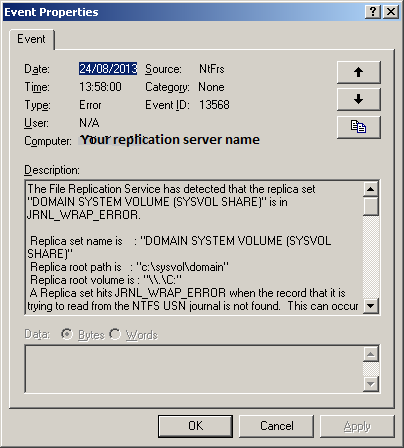 The reinitialized computer runs a full replication of the affected replica sets when the relevant replication schedule begins. When the process is complete, an event 13516 is logged to signal that FRS is operational. If the event is not logged, there is a problem with the FRS configuration. Open command prompt and type 'net stop ntfrs' which will stop the services. Events 13553 and 13516 have been logged in the FRS event log. These events indicate that the membership to the replica set has been established on the computer that is configured for the authoritative restore. The computer that is configured for the authoritative restore is configured to be authoritative for all the data that you want to replicate to replica set members. In the Edit DWORD Value dialog box, type D4 and then click OK.
Start the FRS service on all other servers that where having bad copies of SysVol and it will start replication. The value for the BurFlags registry key is set back to 0. An event 13566 is logged to signal that an authoritative restore is started. Files in the reinitialized FRS replicated directories remain unchanged and become authoritative on direct replication. Additionally, the files become indirect replication partners through transitive replication. The FRS database is rebuilt based on current file inventory. Now add the servers to replication monitor and make sure that there is no replication issues.